Choosing a Skadar Lake tour is the best way to get to the beautiful nature of Montenegro and enjoy the company of local people. Taste traditional homemade products of this area; wine, spirits, and local food in the original ambiance of the old village on the coast of the lake. Have a boat tour on the lake and visit the old town Kotor. Next, have a panoramic drive along the Budva Riviera, the most beautiful part of the Montenegrin coast. 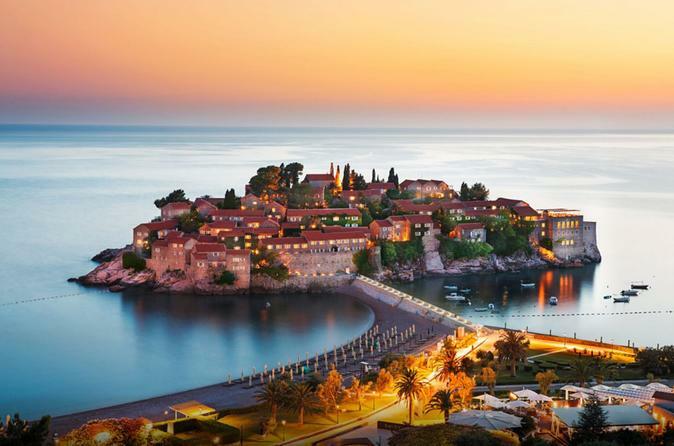 Reach the island of Sveti Stefan, which is the most famous island on the Adriatic. The former fishing village situated on a peninsula became a hotel-town 50 years ago and since then it is visited by Holywood stars and Royal families. Lake Skadar has been a protected National Park since 1983, and it was formally nominated for UNESCO heritage status in 2011. The area is a National Park and the lake is a birder's paradise, with more than 260 different species including the rare Dalmatian pelican. Have a one-hour boat tour on the lake and feel free to swim and relax along its shore. This area is popular for wineries used to produce the famous Montenegrin red wine Vranac, a product that Montenegrins are extremely proud of! As well as wine, locals are proud of brandy and food specialties, which are mostly presented with a fish menu, olives, ham, cheese, olive oil, seasonal salad and freshly picked fruit. Visit a family run winery and have a light lunch with local specialties and wine. This is an awesome experience to remember! After this, you return to Kotor and visit the old town with its medieval buildings and beautiful streets, squares and palaces, like the 12th century cathedral of St Tryphon. The well preserved fortified walls of Kotor are nearly 3 miles long and it is considered one of the world's historic values. A great number of monuments have made Kotor a UNESCO listed "World Natural and Historical Heritage Site"
At the end of your tour your driver will take you back to the pier.